WILLEMSTAD - The GGD Amsterdam (Public Health Department) continues to measure air quality in, for example, Julianadorp in Curaçao, where many Defense personnel live. 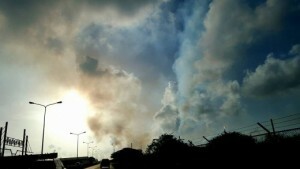 This is because of the concern that exists for harmful substances that the Isla refinery emits. The Dutch Ministers of Defense Ank Bijleveld-Schouten and Suzanne Camelia-Römer of Health, Environment and Nature of Curaçao agreed that the measuring of air quality is continued. Measurement results do not yet give cause for concern. The first report dates from September last year. The GGD Amsterdam carries out measurements at several locations in Curaçao and at the request of Defense also in Julianadorp. With the agreement, the cooperation between Curaçao, the Ministry of Defense and the GGD Amsterdam has been strengthened. The amount of harmful substances is closely monitored. When the measurement results have been analyzed, the GGD Amsterdam publishes them on its website.